Assalam,cakkkk...diam tak diam dah 2 bulan tak mengupdate blog kesayangan kita ni..dari bulan puasa hinggalah sampai raya dah habis ..ish ish..biasalah alasannya..sibuklah, tak ada moodlah..malaslah..semua ada...ok ok..hari ni mood ada baik so cepat2 on computer dan masukkan apa2 yang patut kat draft..sebelum terlupa .. 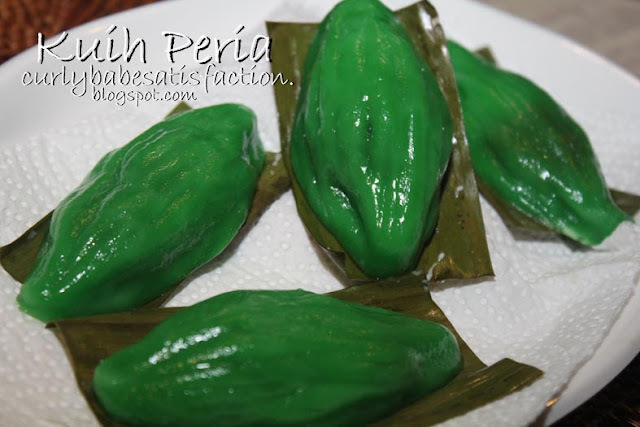 Combine limewater, salt, pandan juice & colouring & mix well. Pour into the flour. 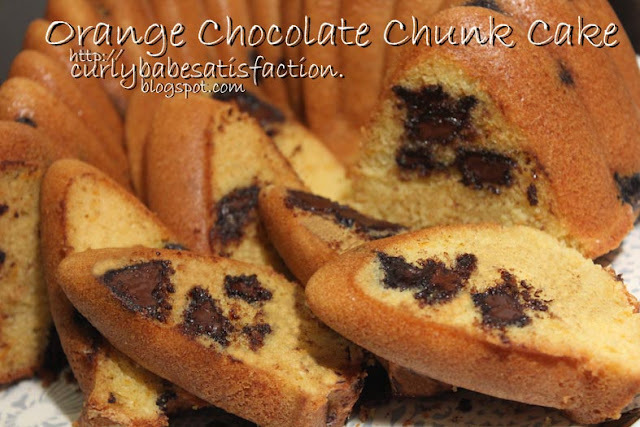 Add in coconut milk & mix thoroughly to form a smooth & soft dough. Take some dough (I weighed 25g.) Spoon a teaspoon of filling onto the dough & seal. Roll the dough gently between palms till round. Then roll it to form an oval. Using the thumb & forefinger, gently pinch the two ends of the oval dough. Then, use the blunt edge of a knife & press some lines to create the 'bitter gourd'. 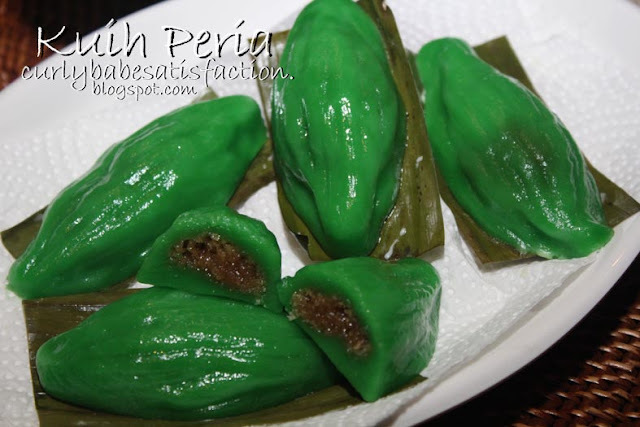 Place the kuih on a piece of banana leaf which has been lightly greased with oil. Brush the top of kuih with some coconut milk wash.
Do the same with the rest of the dough. Steam for about 15 minutes. Then brush the cooked kuih with the coconut milk wash again before serving. 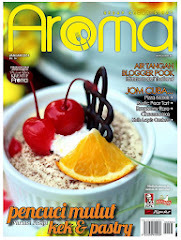 Combine water, gula Melaka, granulated sugar into a saucepan & boil the mixture. Strain & pour back into the saucepan. 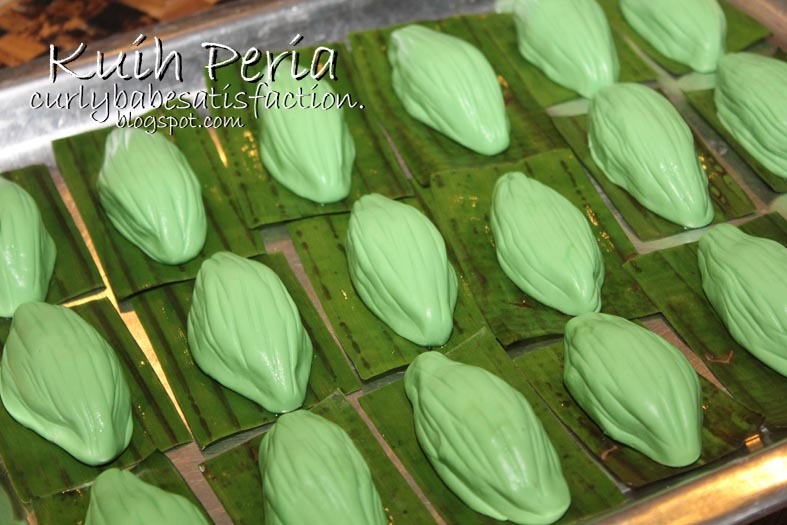 Add in coconut, pandan leaf & salt. Stir until cooked & almost dry. Set aside to cool. Combine both ingredients in a saucepan & cook over low fire, stirring frequently, until it starts to boil. Set aside to cool. Recipe from Sedap Magazine (October 2014). I had to add more liquid (65 ml more) to the dough because my dough was quite dry. Please adjust the liquid accordingly. The dough should be smooth & moderately soft.